It’s less than a month to go to the biggest sporting event in Australasia – the eight million dollar Melbourne Cup. The “race that stops a nation” attracts the best horses from right around the world and is becoming harder and harder to win. So three heavy hitters of the New Zealand racing industry got together to figure out how to bring it home. Murray Baker, Chris Waller and James McDonald have all come close to winning racing’s greatest prize, but haven’t been able to get their hands on the Cup – yet. Sydney-based Waller is the mastermind behind the best horse in the world…Winx. Across the ditch, they’re following her every move as she looks to win a historic fourth consecutive Cox Plate, but Waller has half an eye on the Melbourne Cup too. “It’s a race that we do need to win,” Waller said. Murray Baker’s been trying to win it for nearly 30 years . 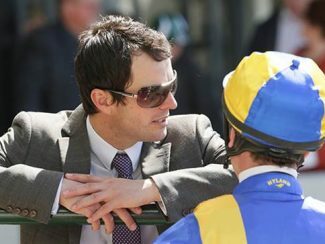 “It’s just the lure of the spring carnival – I’m addicted to it,” said Baker. Baker’s had plenty of success in Melbourne over the years – he loves beating the Aussies and bringing the cash back to Cambridge. 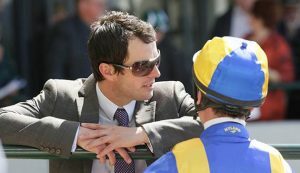 “Money’s huge and, ah, it just keeps going up, said Baker, who trains in partnership with Andrew Forsman (pictured). “It’d mean everything,” Baker said It’s the race everyone wants to win. And that includes the jockey’s. Top Kiwi reignsman James McDonald nearly did just that on his Melbourne Cup debut – guiding ‘Fiorente’ to a runner-up finish in 2012. “[Fiorente] won the year after. Unfortunately I wasn’t on him,” MacDonald said. As MacDonald fights back from an 18 month suspension, he’s more determined than ever to win the big one. “It’d mean more this year because of what’s happened over the last two or three years,” said MacDonald.